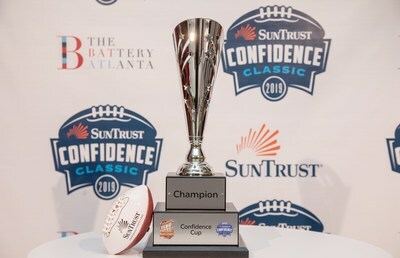 ATLANTA, Jan. 16, 2019 /PRNewswire/ -- SunTrust Banks, Inc. (NYSE: STI) and the Atlanta Braves team up to host a first-of-its-kind football experience, the "SunTrust Confidence Classic," as local families and avid sports fans converge in Atlanta for the big-game weekend February 2-3, 2019. The fan extravaganza includes a free two-day Fan Fest, with football-themed games and prizes, and the Celebrity Sweat 19th annual "Celebrity Flag Football Challenge" that pits two star-studded teams in head-to-head combat for the coveted "Confidence Cup." The SunTrust Confidence Classic will take over SunTrust Park and The Battery Atlanta to provide locals and visitors with an unforgettable entertainment experience. "SunTrust believes that with financial confidence, anything is possible. 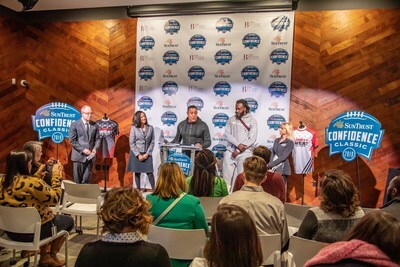 We are celebrating athletic confidence with this one-of-a-kind, celebrity-filled football experience on the weekend that Atlanta hosts one of the largest sporting events in the world," said Susan Somersille Johnson, chief marketing officer for SunTrust. "The Confidence Classic provides our hometown and visiting sports enthusiasts with an affordable way to get involved in the excitement of the big game and create story-worthy memories with friends and family." "SunTrust Park and The Battery Atlanta were designed as community gathering places and the SunTrust Confidence Classic provides a must-visit experience for our fans and guests," said Atlanta Braves President and CEO Derek Schiller. "Atlanta has become a premier destination for many of the nation's top sporting events, and we look forward to hosting this family-friendly event where fans will get to see a great competition inside of SunTrust Park and then enjoy all the restaurants and entertainment activities going on in The Battery Atlanta." "We are teaming up with SunTrust and the Atlanta Braves to entertain residents and visitors while giving back to the local Atlanta community," said Celebrity Sweat CEO Lisa Levine. "Proceeds from the Celebrity Flag Football Challenge will go towards strengthening financial confidence for veterans and helping Atlanta school children pursue their dreams." Celebrity Sweat is the #1 celebrity lifestyle show, currently entering Season 5. You can catch up on previous seasons and gear up for all Season 5 action at Amazon Prime, as well as through Discovery and Cox TV. Celebrity Sweat is all about working with athletes and entertainers to ultimately educate, motivate and inspire people to live active and healthy lives. For more celebrity training tips, recipes and updates – go to Celebritysweat.com.